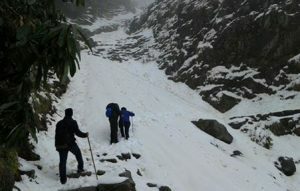 “Are we going to attempt to hike the Triund Trail?” Asked Rupankar, my nephew. We two, along with my wife Shelley, were entering on road into Dharamshala to pay a visit to our relatives, settled in the town. 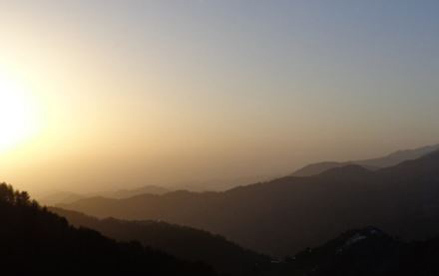 Dharamsala rests on a valley nestled into the Dhauladhar Mountain range, an extension of the Himalayan range in north-east India. 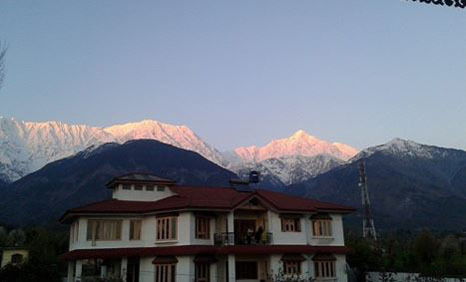 The view of snow-capped peaks, glowing in the setting sunlight of the afternoon, offered us our first “Whoa!” moment. To the international community, Dharamshala is best known as the abode of the exiled Tibetan religious leader the Dalai Lama. The town, besides being majestic, is also the starting point for a hiking trail known as the Triund Trail. From its trailhead near a religious shrine known as the Gallu Devi Temple in the neighboring town of Dharamkot, the trek is about 8 – 9 km one way up the mountain to the top of the Triund Hill. Once there, one gets a majestic panoramic view of three year-around snow-capped mountains. Thus, one early morning we embarked on a hike on the trail along with our local guide Johny with a plan of camping or finding rooms in a government-run rest house at the end of the trail for the night for our return hike on next day. Initially, the winding trail passed through tall trees of a lower valley forest on both sides, while a cool breeze was blowing down from the higher altitude. At one corner, we came to an open area to observe a gorgeous sun-rise from behind the distant mountain range. As we continued the journey, an expanse of snow-covered distant mountain range came to our view. At this time, Johny informed us about a snowfall at higher altitudes on previous night, even in the month of March. As we hiked upwards, the sign of snow-fall that Johny mentioned started to become visible. Soon, we arrived at a site where the trail was along the ridge between two neighboring mountains. The fallen snow here became knee-deep. I suddenly realized, so far through our hike, we did not see a single hiker on either direction on the trail. After carefully navigating the trail along this ridge, we arrived at an open space on the other side and found ourselves to be confronted by an upcoming storm, always an unpredictable event in the mountains. This storm, creating a dark atmosphere, started as a slow freezing rain. So we continued. But, soon it became violent, turning rain into hails. 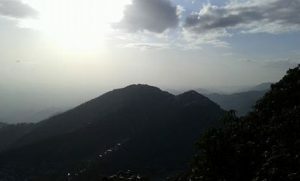 Fortunately, we were near an observation point known as Magic View and Johny previously had mentioned about a tea shop there. To our delight, we found the gentleman running the place, even in this weather, kept it open for the hikers. A near-by sign noted “Magic View, oldest chai shop, since 1984”. After making some hot tea for us, the gentleman at the shop kindly arranged for a fire for us to warm up. 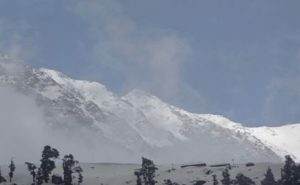 However, he also notified us that the trail going up beyond his tea shop had been covered by almost waist-deep snow from the previous night’s snow-fall in the area and might be too dangerous to explore. So, the decision was made not to advance any further, even though we were not that far from our destination. Disappointed, we turned around. On our way back, we were rewarded with a spectacular sun-set at a distance with mountain ranges all around us appearing as mystic silhouettes, as the day slowly changed into an evening. Though the destination remained unattainable, the journey itself felt rewarding and had a soothing effect, as if it was a meditation amidst nature. We navigated snowy trail as far as we could, faced an unexpected mountain storm but remained pragmatic with our decision of turning back while not panicking but maintaining our inner serenity. “No regret. The journey itself was worthy.” Announced Rupankar.